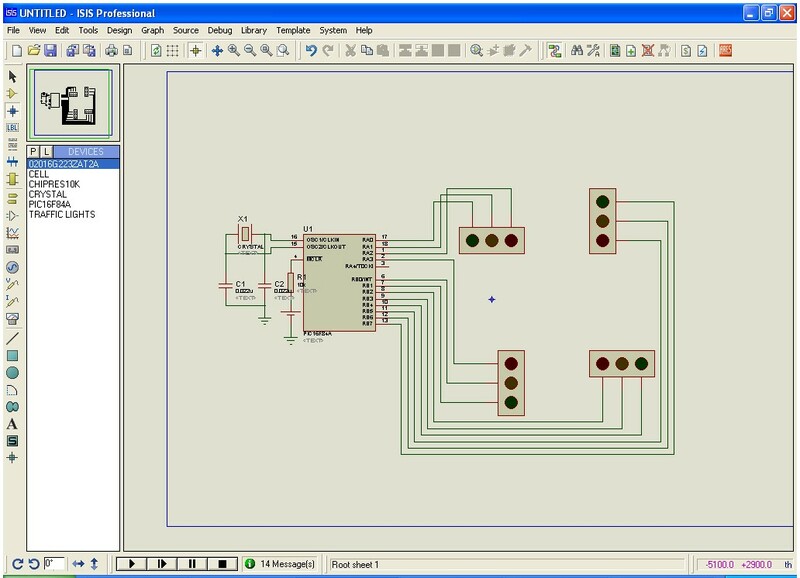 Hi friends, today we are going to make a four-way traffic light controller using a PIC16F84A microcontroller (Automatic Street Light). In this project, we will operate three LEDs (RED, YELLOW, and GREEN) according to the traffic rules. Illumination of the green light allows traffic to proceed in the direction denoted. Illumination of the yellow light denoting, if safe to do so, prepare to stop short of the intersection. Illumination of the red signal prohibits any traffic from proceeding. 22uF capacitor – 2 no. 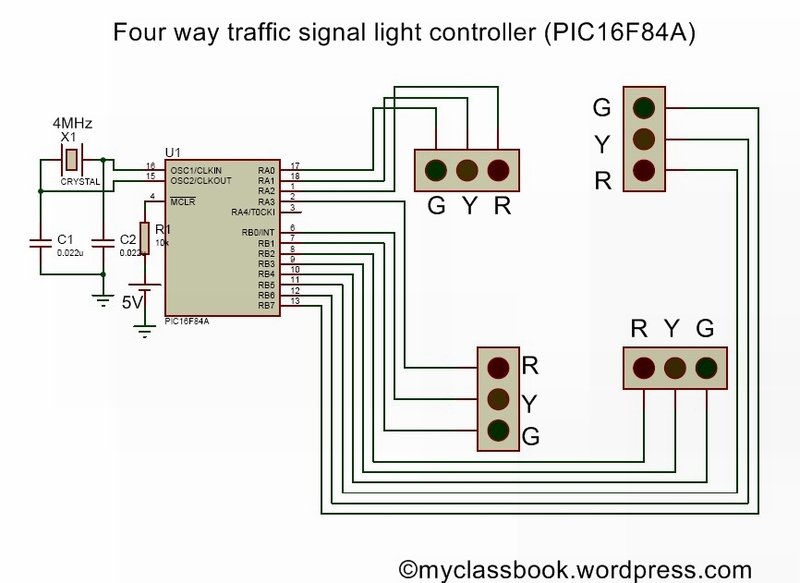 In this project, we are going to operate (control) a four-way traffic light signal using PIC16F84A microcontroller. The first thing we have to do is, simply connect four set of Red-Green-Yellow LEDs to respective pins of PIC16F84A microcontroller as shown in circuit diagram. (you can also use separate LEDs just connect all common terminals (negative) to ground with 330O resistor in series with each LED). 5V supply to the pin number 14. Connect two 22uF capacitors in parallel with two terminals of the crystal oscillator. Make all the remaining connection as shown in the figure. If you like this Automatic Street Light article, please share it with your friends and like or facebook page for future updates. Subscribe to our newsletter to get notifications about our updates via email. If you have any queries, feel free to ask in the comments section below. Have a nice day! can you briefly explain about this project? is there anyway to get this code in main.c?? i just manage to have a HEX file..
Is there any way to view the main.c source code? The files in the provided link only has the .HEX file and schematic diagram. Is there got c code? The PIC controller frequency is how much?